GURGAON, India - Dec. 12, 2015 - PRLog -- Credihealth has re-launched its health app, making over 25,000 trusted doctors from 450+ top hospitals available for people in Delhi NCR, Mumbai region, Kolkata, Hyderabad, Chennai, Bangalore, Ranchi and Indore. In addition to the metro cities, Credihealth gets approximately 50 per cent of its patients from Tier-II and Tier-III cities. Our services include comparisons between doctors, hospitals, treatment packages and consulting the patient on insurance related matters. With the recent release of its services in Ranchi and Indore, Credihealth is planning to launched in several other cities across India, making it possible for people to book their doctor’s appointment completely hassle-free. The app’s main features include checking Doctor credentials, years of experience, education qualifications, OPD schedule and consultation fees. 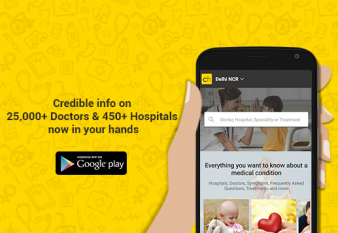 The app makes it easier for people to get details about amenities and services of over 450 Hospitals across India. Max Healthcare, Fortis Healthcare, Global Hospitals, Apollo Hospitals, Manipal Hospitals, Narayana Health. Credihealth empowers people to make informed healthcare decisions by providing credible hospital and doctor information, supporting the patient through their hospitalization and bringing transparency. About Credihealth Blog: Browse through over 250 famous doctor interviews and read comprehensive articles explaining symptoms, treatment methods and prevention tips from diseases on the Credihealth blog. We also have a section on the blog dedicated to our Facebook group of over 10,000 members The New Moms Club, where they share stories and opinions, we also schedule experts and doctors for Live chats. To promote survivor stories of patients who’ve struggled through serious illnesses, we launched the CrediHeroes section. These inspiring stories are motivational for patients and informative for others. You can find out more on www.credihealth.com or call toll free 1800 1022 733.